1 - 5 $346.66 ea. 6 - 11 $338.10 ea. The Daniels AF8 has virtually limitless application within the wire range of 12-26 AWG. Over 1,000 turret heads or positioners are available to adapt the tool frame to your specific military or proprietary contact/wire combination. The eight impression crimp, which is standard in the AF8, assures absolute maximum tensile strength with almost every closed barrel contact. 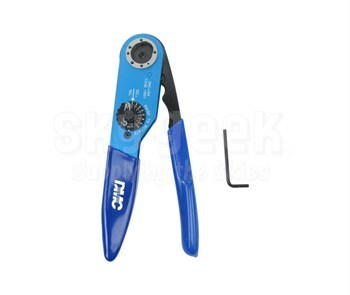 The precision ratchet controls cycling on the tool in both directions of handle movement. This assures the same, accurate crimp every time. It's like having a QC inspector at every work station. Positioners and Dies sold separately. Size: approx. 9-3/4" x 2-1/2" x 1-1/4"